In September 1976, Lebanese leaders (I think it’s safe to call them warlords by now) met in Cairo in order to find a peaceful solution to the crisis. Today, you’ll read three cables (one for the 15th of September, one for the 16th of September, and one for the 17th of September) about these negotiations. SUMMARY. SARKIS AND JUMBLATT REPORTEDLY TO FOLLOW KARAMI, GEMAYEL AND OTHERS TO CAIRO. SADAT MET SEPT. 14 WITH KARAMI AND MUSA SADR SEPARETLY AND WILL RECEIVE GEMAYEL AND SALAM SEPT. 15. GOE REPORTEDLY IN CLOSE CONTACT WITH ARAFAT. LOCAL DAILIES DIFFER ON MILITARY INTENTIONS OF SARG. END SUMMARY. 1. CAIRO DAILIES EPT. 15 PREOCCUPIED WITH WHAT THEY PERCEIVE AS INCEASINGLY CRUCIAL GOE ROLE IN NEGOTIATIONS ON LEBANON. PRESIDENT ELECT SARKIS TO VISIT CAIRO SEPT. 18/19 AND HE RECEIVED BY SADAT IN ISMAILIYA. JUMBLATT HAS REPORTEDLY ANNOUNCED THAT HE WILL VISIT CAIRO PRIOR TO SEPT. 23 INSTALLATION OF SARKIS AND FORMER LEBANESE PRIMIN TAKI AL-DIN AL-SOLH APPARENTLY TO ARRIVE CAIRO SEPT 16 WITH MUFTI OF LEBANON SHAIKH HASAN KHALID. 2. ALL DAILIES CARRY FRONT-PAGE PICUTRES OF MEETING IN MIT ABU AL-KOM BETWEEN KARAMI AND SADAT, ALSO ATTENDED BY VP MUBAREK, PRIMIN SALIM AND DEPRIMIN/FONMIN FAHMY. NO DETAILS GIVEN. PHALANGIST LEADER GEMAYEL AND FORMER PRIMIN SA’IB SALAM WILL MEET (PRESUMABLY SEPARATELY) WITH SADAT SEPT. 15. SHI’ITE IMAM MUSA SADR REPORTEDLY CONFERRED WITH SADAT SEPT. 14. “OFFICIAL EGYPTIAN SOURCES” AFFIRMED THAT GOE IS IN CONTINUOUS CONTACT WITH ARAFAT AND THAT EGYPT NOW FULLY COGNIZANT OF PLO STAND ON LEBANESE QUESTIONS. OFFICIAL SOURCES ALSO STATE THAT GOE CURRENTLY HOLDING DISCUSSIONS WITH NATIONALIST FORCES REPS FORMER MINISTER ABBAS KHALAF AND TAWFIG SULTAN. 3. ALL DAILIES FEATURE STATEMENT BY GEMAYEL TO PRESS AFFIRMING THAT HE “CONSIDERS EGYPT HIS SECOND HOME” AND THAT HE “LOVES EGYGT AS HE LOVES LEBANON BECAUSE EGYPT IS THE ELDER SISTER AND EXTENDS A HELPING HAND.” GEMAYEL ALSO REORTEDLY STATED THAT PHALANGISTS DO NOT DIFFER WITHOTHERS OVER PALESTINIAN CAUSE OR WITH PALESTINIAN RESISTANCE ITSELF. PRELUDE TO MILITARY DRIVE PRIOR TO INSTALLATION OF SARKIS. 5. IN BRIEF CONVERSATION WITH CHARGE SEPT. 14 BOTH FAHMY AIDE AL-BAZ AND GOE AMBASSADOR TO LEBANON MITWALLI (WHO CONSULTING IN CAIRO AND EXPECTS RETURN TO BEIRUT WITH SARKIS SEPT. 19) EXPRESSED CONSIDERABLE OPTIMISM. MITWALLI VOLUNTEERED THAT DESIRE TO END CARNAGE IS NOW STRENGTHENING FAST IN LEBANON. 6. COMMENT: EGYPTIANS PLEASED BY NEW-FOUND PROMINENCE ON LEBANESE ISSUE AND CAIRO PRESS, IN IMITATION OF ITS SYRIAN COUNTERPART, VIRTUALLY IGNORING EVENTS IN DAMASCUS AND PORTRAYING CAIRO DISCUSSIONS AS ONLY GAME IN TOWN RE POSSIBLE LEBANESE SOLUTION. 7. DESPITE WHIRLWIND OF ACTIVITY, FROM EMBASSY VIEWPOINT, OUTCOME OF DISCUSSIONS IN CAIRO CONTINUES TO HINGE ON EGYPTIAN- SYRIAN REALTIONSIP AND UNLESS DAMASCUS AND CAIRO AGREE ON HOW TO DEAL WITH LEBANON, CURRENT TALKS WERE LIKELY TO BE MORE FOR FORM THAN SUBSTANCE. IMAM SADR CLAIMS TO BE PROMOTING GOE-SARG RAPPROCHMENT AND OTHERS MAY BE DOING SAME. DOES EMBASSY DAMASCUS BELIEVE ASAD SO DETERMINED TO END FIGHTING THAT HE NOW WILLING TO PERMIT GOE TO PARTICIPANT IN SETTLEMENT? 1. PARADE OF LEBANESE LEADERS TO EGYPT CONTINUES. PRES SADAT MET 15 SEPT IN MIT ABU AL-KOM WITH PHALANGIST LEADER GEMAYEL, WITH DEPRIMIN FONMIN FAHM IN ATTENDANCE. FORMER PRIMIN SALAM MET OVER TWO HOURS WITH PRIMIN SALIM SEPT 15 AND WILL MEET WITH SADAT TODAY. SHAIKH HASAN KHALID, MUFTI OF LEBANON, WILL ALSO MEET (SEPARATELY) WITH SADAT TODAY. FAHMY MET WITH SHI’ITE IMAM MUSA SADR SEPT 15 AND MINCULTURE AND INFO OTEIFY MET WITH GEMAYEL, PRESUMABLY AFTER LATTER’S TALK WITH SADAT. LOCAL JOURNALISTS TELL US THAT CONSID- ERABLE PUBLICITY GIVEN TO MEETING SEPT 15 BETWEEN PRIMIN KARAMI AND BASHIR GEMAYEL, WHO APPARENTLY VISITING IN CAIRO WITH HIS FATHER. 2. LOCAL DAILES INDICATE THAT JUMBLATT VISIT HAD BEEN DELAYED BECAUSE HE UNWILLING TO TRAVEL TO DAMASCUS TO TAKE PLANE TO CAIRO. NOW JUMBLATT REPORTEDLY WILL TAKE SPECIAL AL PLANE FROM BEIRUT AIRPORT DIRECTLY TO CAIRO ON UNSPECIFIED DATE. 3. MOOD OF LOCAL DAILIES RE LEBANESE DISCUSSIONS CONTINUES HIGHLY OPTIMISTIC AND PAPERS CITE SPECULATION OF “POLITICAL SOURCES IN BEIRUT” THAT ROUND TABLE DISCUSSIONS OF PARTIES INVOLVED IN LEBANON MAY BE HELD (DATE UNSPECIFIED) AT QUBA PALACE IN CAIRO UNDER SUPERVISION OF PRES SADAT HIMSELF. 4. IMAM MUSA SADR AGAIN RECEIVES CONSIDERABLE PLAY IN LOCAL PRESS. SADR STATED HE CONFIDENT LEBANESE CRISIS WILL END WITHININ MONTH AND THAT “PRACTICAL STEPS WILL BE TAKEN WITHIN A WEEK” TO RESTORE SECURITY TO LEBANON. HE SPECULATED THAT “TOP LEVEL MEETINGS” BETWEEN EGYPTIAN AND SYRIAN OFFICIALS WILL BE HELD IN COMING FEW DAYS NOW THAT “ACCUMULATED DIFFERENCES IMPEDING SYRIAN-EGYPTIAN SOLIDARITY HAVE BEEN REMOVED.” SADR AFFIRMED THAT LEBANESE SOLUTION IMPOSSIBLE WITHOUT EGYPTIAN-SYRIAN SOLIDARITY AND COOPERATION. CURRENT PHALANGE OPPOSITION TO SOME PLO ELEMENTS. GEMAYEL NOTED THAT SYRIA MEMBER OF AL AND UN AND HAS PLEDGED, AS RESPONSIBLE MEMBER OF WORLD COMMUNITY, TOWITHDRAW FROM LEBANESE TERRITORY WHEN LEGITIMATE LEBANESE AUTHORITY SO REQUESTS. AT PRESENT, LEBANON “DROWNING PERSON CLINGING TO STRAW (SYRIA) AND THIS SITUATION CAUSED BY INTERNATIONAL LEFT AND COMMUNISTS WHO ATTACKING LEBANON.” GEMAYEL STRONGLY DENIED THAT PHALANGISTS RECEIVING ISRAELI ARMS AND STATED THAT PICKTURES OF PHALANGIST FORCES WEARING CROSSES WHILE KILLING MUSLIMS MERELY CHEAP WEAPON IN HANDS OF TRAITORS AND SPIES WHO TRYING TO CAUSE SECTARIAN STRIFE IN LEBANON. 6. GOVT MODIFICATIONS ANNOUNCED SEPT 15 BY FRANJIYA, STRIPPINGKARAMI OF PORTFOLIOS OF DEFENSE, FINANCE AND INFORMATION AND NAMING CHAMOUN ACTING PRIMIN NOTED WITHOUT MUCH COMMENT IN CAIRO DAILIES AND GEMAYEL STATEMENT THAT HE HAD BEEN UNAWARE OF THIS IMPENDING ACTION DULY NOTED BY PRESS. NO SPECULATION AS TO SIGNIFICANCE OF MOVES BY FRANJIYA, EIGHT DAYS BEFORE INSTALLATION OF SARKIS, CARRIED IN LOCAL PRESS OTHER THAN ANODYNE COMMENT THAT WITH CHAMOUN AS ACT- ING PRIMIN, FRANJIYA AND CHAMOUN CAN CONVENE CABINET MEET- INGS AND MAKE DECISIONS IN ABSENCE OF KARAMI. NEWS OF FRAN- JIYA MOVE MAY HAVE COME TOO LATE FOR EXTENSIVE PRESS COMM- ENTARY SEPT 16. 7. COMMENT: LOCAL MOOD OF OPTIMISM REGARDING LEBANESE TALKS STILL PREVAILS ALTHOUGH FRANJIYA-CHAMOUN MOVE AGAINST KARAMI, WHICH UNDERCUTS SARKIS BEFORE HE EVEN ASSUMES OFFICE, CERTAINLY STRIKES AMINOUS NOTE. THERE NO SPECULATION IN LOCAL PRESS AS TO WHETHER CHAMOUN DISCUSSED MOVE AGAINST KARAMI DURING MOST RECENT VISIT TO DAMASCUS, BUT MOVE WILL UNDOUBTEDLY REMIND LEBANESE VISITORS TO CAIRO THAT THEY HAD BETTER NOT FORGET CHRISTIAN HARD LINERS. AS YET, THERE NO SPECULATION FROM LOCAL OFFICIALS OR IN LOCAL DAILIES AS TO HOW AND WHEN CAHAMOUN AND HIS NLP FORCES CAN BE BROUGHT INTO LINE. STATEMENT AFTER MEETING FOR RESTORATION OF EGYPTIAN/SYRIAN SOLIDARITY. EXPRIMIN TAQI AL-DIN AL-SULH TO ARRIVE SEPT 17, BUT MAJOR FOCUS OF DAILIES ON UPCOMING ISMAILIYYA MEETING BETWEEN SADAT AND SARKIS SEPT 18. 2. PHALANGE LEADER GEMAYEL AND PARTY DEPARTED CAIRO FOR DAMASCUS SEPT 16. IN DEPARTURE STATEMENT, GEMAYEL REITERATED SYRIAN WILLINGNESS TO WITHDRAW SHOULD LEBANESE GOVT SO REQUEST, AND NOTED THAT THERE NO DIFFERENCES BETWEEN AL PEACE-KEEPING FORCES AND SYRIAN FORCES IN LEBANON. GEMAYEL ALSO CAME OUT STRONGLY FOR EGYPTIAN/SYRIAN REAPPROACHMENT AS SINE QUA NON FOR SETTLEMENT OF LEBANESE CRISIS. 3. EGYPTIAN DAILIES SEPT 17 HAD HAD SUFFICIENT TIME TO DIGES RECENT CABINET CHANGES EFFECTED BY FRANJIYA AND CAME OUT STRONGLY AGAINST ASSUMPTION BY CHAMOUN OF PRIMIN KARAMI’S FINANCE, INFO AND DEFENSE PORTFOLIOS AND OF ACTING PRIMIN- ISTERSHIP. KARAMI DENUNCIATION OF FRANJIYA MOVES COVERED EXTENSIVELY IN LOCAL DAILIES, WHICH ALSO REPORT DENUNCIATION OF CHANGES BY MUSLIM CIRCLES IN LEBANON. 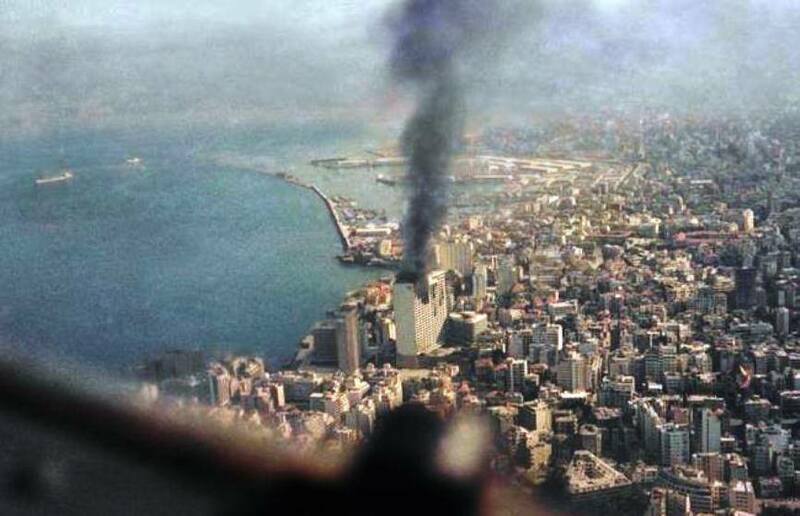 PHALANGE INSISTENCE THAT BEMAYEL HAD NOT BEEN CONSULTED IN ADVANCE ALSO REITERATED IN PRESS COVERAGE. 4. AGAIN SYRIAN EFFORTS ON NEGOTIATING FRONT VIRTUALLY IG- NORED BY CAIRO DAILIES. ONLY MENTION OF UPCOMING SHUTURA MEETINGS BETWEEN ARAFAT, SARKIS AND DEP SYRIAN DEFMIN NAJI JAMIL APPEARS ON BACK PAGES OF CAIRO DAILIES, TACKED ON TO END OF STORIES ON CAIRO DELIBERATIONS. 5. MENA DEVOTES CONSIDERABLE ATTENTION SEPT 17 TO REMARKS BY DAMASCUS-BASED GREEK ORTHODOX PATRIARCH ELIAS IV OF ANTIOCH WHO REPORTEDLY ISSUED STATEMENT THAT LEBANESE CRISIS NOT IN ESSENCE RELIGIOUS AND THAT ALLEGATIONS TO CONTRARY MERELY IMPERIALIST MACHINATIONS. PATRIARCH ELIAS REPORTEDLY PRIASED POPULAR DISTURBANCES ON WEST BANK AND CALLED FOR DIALOGUE BETWEEN MUSLIMS AND CHRISTIANS IN ARAB WORLD. DAYS, THOUGH OPTIMISM CONTINUES REIGN AT MFA, WHICH IS BANK- ING ON SARKIS VISIT TO MOVE PEACE PROCESS ALONG. IN ADDITION, POTENTIAL RESULTS OF SARKIS/ARFAT/JAMIL MEETINGS NOT YET CLEAR IN CAIRO. POSSIBLY GOE AWAITING SOME SYRIAN INITIATIVE AS PARADE OF POENTIAL MEDIATORS (SHI’ITE IMAM MUSA SADR, GEMAYEL, SALAM) RETURNS TO DAMASCUS TO REPORT THEIR FINDINGS TO PRES ASAD.